"An authentic potsticker recipe using ground beef and ground shrimp instead of the usual pork filling. You can fill the whole package of gyoza wrappers and have filling left over for next time around." Place the shrimp in the work bowl of a food processor, and process until the shrimp are finely ground. Set aside in a large bowl. Working in batches, process the ground beef to a fine grind, and set aside with the shrimp. Combine the shrimp and ground beef with ginger, shallot, green onions, napa cabbage, soy sauce, sesame oil, salt and pepper, and white sugar, and mix the ingredients until thoroughly combined. To fill the pot stickers, place a wrapper on a work surface in front of you, and place a scant teaspoon of filling in the center. With a wet finger, dampen the edges of the wrapper. Fold the dough into a half-moon shape, enclosing the filling, and press and seal to remove extra air and tightly seal the edges together. It's nice to fold several small pleats in the top half of the wrapper for a traditional look before you seal in the filling. Refrigerate the filled wrappers on a parchment-lined baking sheet while you finish filling and sealing the pot stickers. Heat the oil in a large nonstick skillet with a lid over medium heat. Place pot stickers into the hot oil, flat sides down, without crowding, and let fry until the bottoms are golden brown, 1 to 2 minutes. Turn the dumplings over, and pour the water over them. Cover the pan with a lid and let the dumplings steam until the water has nearly evaporated and the dumplings have begun to fry in oil again, 5 to 7 minutes. Uncover the skillet, and let the pot stickers cook until all the water is evaporated and the wrapper has shrunk down tightly onto the filling, another 2 to 3 minutes. 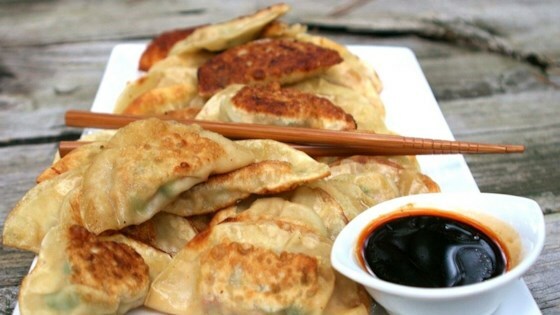 See how to make Chinese dumplings filled with ground beef and shrimp. This recipe makes a large batch of filling, enough for several packages of dumpling wrappers. You can freeze filled, uncooked pot stickers by placing them on parchment-lined baking sheets without touching, letting them freeze solid, then placing the individually-frozen pot stickers into plastic bags for storage. The nutrition data for this recipe includes the full amount of the filling ingredients. GREAT RECIPE! I used ground pork instead of the shrimp/ground beef. They tasted just like restaurant made.